First, let me start by thanking you all for your kind comments on my new haircut! You sure now how to make a girl feel cute! 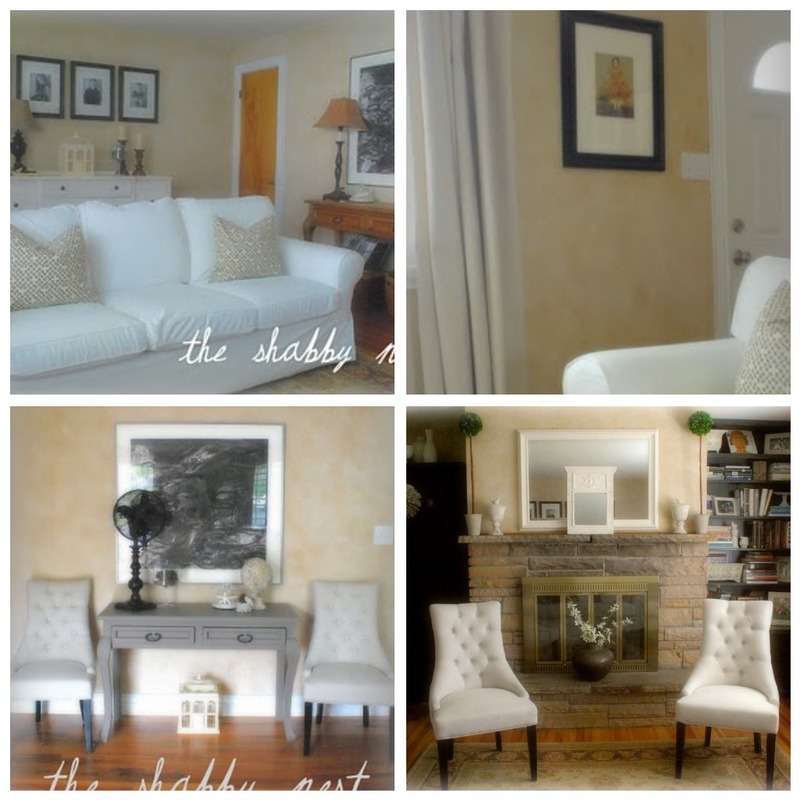 We have been making progress on our living room redo...and I am really loving the results so far. Every time I post about a room redo in our house, I feel the need to preface it by saying that we are living in a rental house right now. We cannot paint the walls, we cannot alter the house. So I have to work with the raw material that was here. I would definitely repaint if I could. But that said, I'm happy with how the living room is coming together. Over the weekend we painted the dresser, painted the rehabbed console white - this was a subject of much debate between the hubby and myself - and moved it behind the sofa (what a creative place for a console table, huh?) We also began adding in some touches of blue. The room is still in need of some styling and some accessories, not to mention something substantial to replace the console under the large charcoal (we're thinking a bench is in order) but here is a look at how it's coming together so far. I just noticed that I didn't actually include a picture of the console painted white (or the fireplace for that matter - but I have posted plenty of those photos recently)...I promise to post one of the rehabbed-rehabbed console in the near future...my bad. Frugal Friday goes live Thursday at 10:00 pm EST. Can't wait to have you all join me here for the Frugal goodness! It has turned out so well! I love all the mixes of grays, browns, bieges and blues!!!! Thanks for sharing!!! P.S. I do like the new hair cut!! I think you are doing a FABULOUS job ~ can't wait to see it once you tweak it! It looks great! 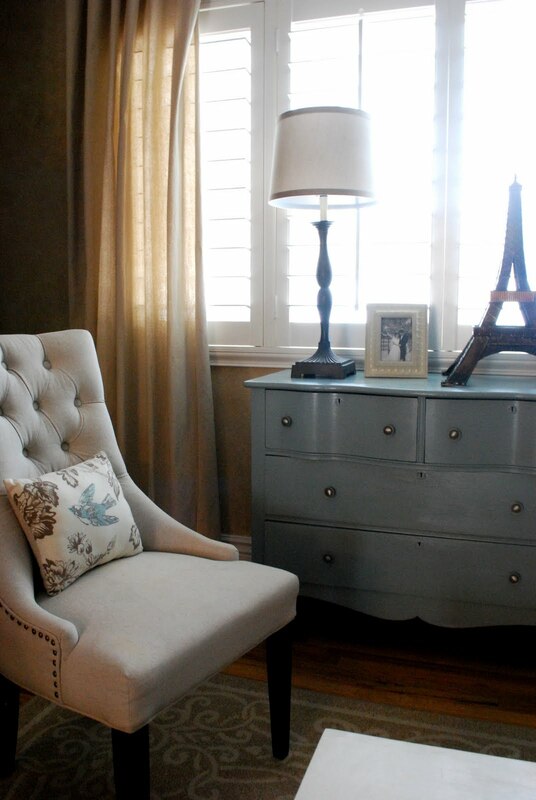 I am in looove with blue, and can't wait to incorporate it into my new house. I love how you've added it in this room. I especially love the bird pillows--where did you get them? Just beautiful, you have taken a rental beyond beautiful, you and your husband make a great team! Love your bangs too! It is gorgeous! It reminds me of Pottery Barn. 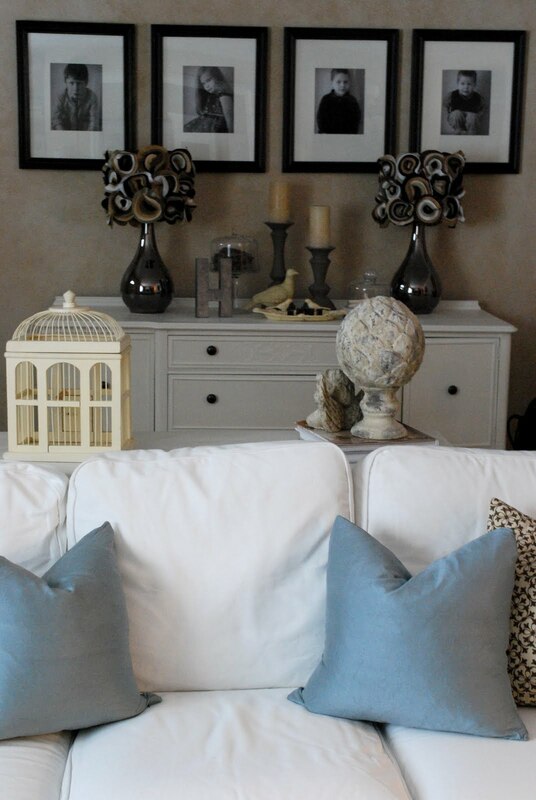 A perfect mix of subtle rustic colors with whites. Lots of old world textures, and the black and white photos. Perfect. 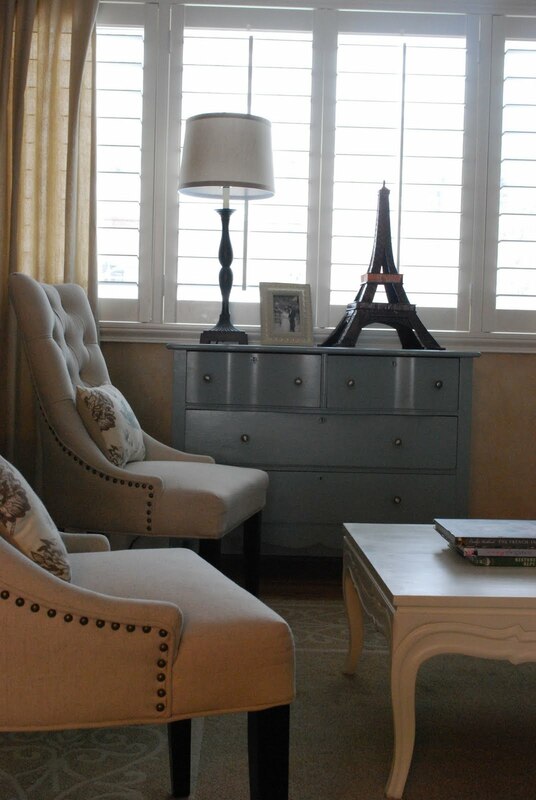 I love painted pieces, and your living room looks great. The bangs do, too!! It's all beautiful, but I LOVE the fabric on your chair pillows! Hello!! Happy New Year!! I love your living room. The two chairs are perfect!! I also love your bangs. I wish I had the nerve to cut mine off and go straight. Hummmmm.... wheels are turning. Tomorrow I'm off to get a little Botox. Shhhhhhh... don't tell anyone. :) Hugs to you and yours. I'm so glad that you hubby is doing better. I think that your living room looks amazing! You have achieved a real sense of calm in that room ... 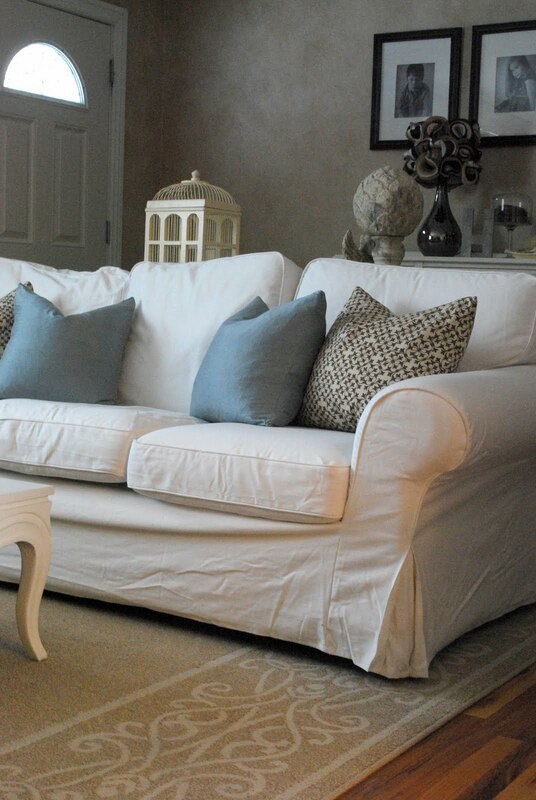 I am dying to know your secret in keeping your sofa so white with four kids - please share (I need to convince my hubby that it is possible)! I can't believe it is a rental...it is just beautiful. The owners must be very pleased to have you take such good care of their house. Gosh! Shabby to you looks like elegant to me! Awesome! It looks almost like what MY living room is turning out to be. ha! Really though... I love your sense of style! Thanks for sharing these photos. Everything looks beautiful! Just beautiful. I love the blue. And I swoon over your chairs every time I see them. I think it looks lovely! At least the walls are pretty neutral since you can't paint them. I don't think the walls look bad at all. Everything looks so beautiful. A lovely room. Everything is so beautiful. I love the soft colors and the calm feeling of the room. Adore those two chairs.